After almost a century of controversy on the matter, it seems that archaeogenetics solved the riddle. Not in the sense I thought it would but it did anyhow. 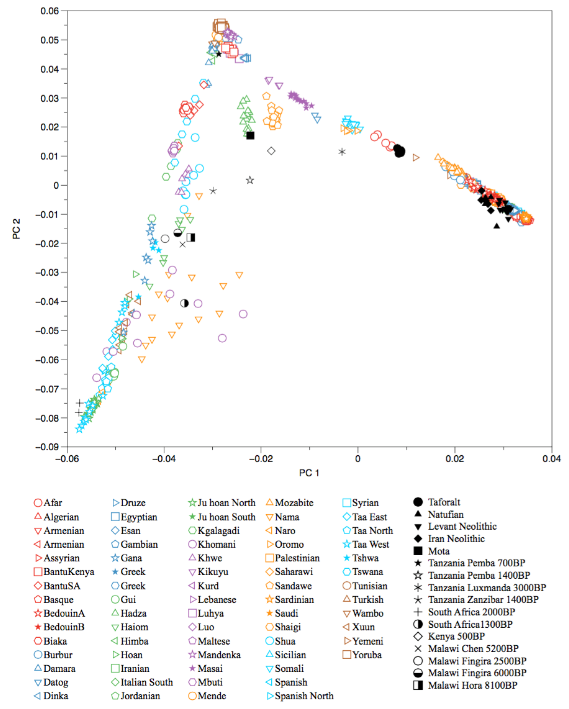 Marieke van de Loosdrecht et al., Pleistocene North African genomes link Near Eastern and sub-Saharan African human populations. Science 2018 (pay per view). DOI:10.1126/science.aar8380 -- See also supplementary materials (free but hard to find). 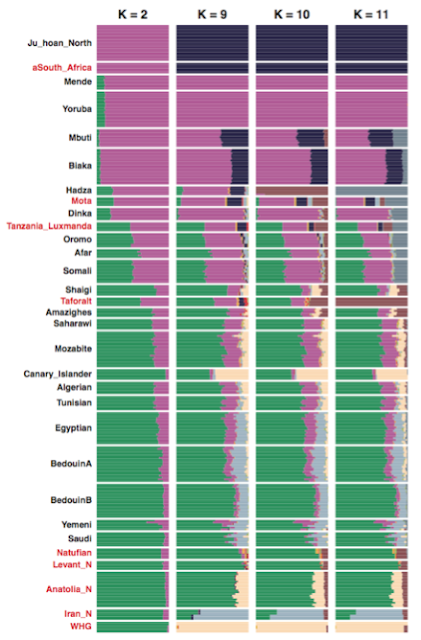 Ancient DNA samples from Taforalt (Iberomaurusian or Oranian culture, Upper Paleolithic of North Africa) show no trace of Paleoeuropean ancestry (WHG), however they show strong affinity to West Asians of Palestinian type, showing also some significant amount of African Aboriginal ancestry, probably closer to East African Hadza and Sandawe and ancient Mota than to West African types. The result is something roughly similar to Afars but not quite the same in any case. Fig. S8 - Taforalt individuals on the top PCs of present-day African, Near Eastern and South European populations. Fig. S11 - ADMIXTURE results for a few informative K values. So the conclusion must thus be that the Eurasian influence in North African Upper Paleolithic (call it Iberomaurusian, Oranian or my personal unorthodox preference: Taforaltian) arrived from West Asia with whichever intermediate stage in Egypt and Cyrenaica, where that influence is quite apparently much older in the archaeological record. This seems contradictory to the chronology of Taforaltian, with Western sites producing older radiocarbon dates but the genetic data seems overwhelming. I must say I wish they would have contrasted with older (and available) Paleoeuropean samples than WHG (Epipaleolithic) but I guess that some WHG influence would have shown up if there was some older European influx because the various Paleoeuropean layers are not disconnected. But it is still something someone should test, just in case. All six male samples carried Y-DNA E1b1b, with most of them being well defined as E1b1b1a1-M78 (see table S16 for details). Related: Luxmanda: a 3,000 years-old proto-Horner in Tanzania. I find it very intriguing that U6 was found in a c. 33 kya old sample in Romania and M in Aurignacian Goyet in Belgium and other later samples. I agree that autosomal results are against any gene-flow via Iberia. If we get more palaeolithic M and U6 from Europe and Near East, an interesting connection may appear. I think there is one study strongly suggesting that E1b-M81 is a "recent" haplogroup. So recent that even I do my usual molecular-clock corrections of multiplying times two (or min. x1.5) the result is still recent. I don't remember the exact date proposed but some time in the Phoenician period maybe (??) and when you multiply that x2 it becomes Late Neolithic but still much more recent than Taforalt. "Do you think that Tafoughalt is the center of the M78 mutations or is it all the Maghreb wich was the theater of these M78 carriers ?" What we are learning now is that certainly NW Africa's (i.e. "Maghreb", I never use that word because it is Arabo-centric) was genetically/demographically connected to NE Africa and to West Asia even at the very beginning of the local Upper Paleolithic, demolishing quite apparently all the theories that linked it to European Upper Paleolithic (from which it got its "Ibero-Maurusian" name). I found that the Y-full estimate for E1b-M81 is 2.7 Ka, which I'd tentatively correct to 4.1-5.4 Ka ago, which is still late in the Neolithic, Chalcolithic even. In linguistics Berber language family also has that issue: it seems to be much more recent than it "should"; so maybe both issues are related, although right now I do not have an exact answer to this conundrum of E-M81 and Berber language late expansion. "I found that the Y-full estimate for E1b-M81 is 2.7 Ka, which I'd tentatively correct to 4.1-5.4 Ka ago"
I always do that with molecular-clock guesstimates because I think it is the correct recalibration to do. Why? Because the out-of-Africa migration happened c. 125 Ka BP and not 60-70 Ka BP as molecular-clock-o-logists believe based on very obsolete archaology; because the Pan-Homo split happened some 8-13 Ma ago and not 5-6 as the molecular-clock-o-logists believe based on very obsolote paleonthology. Everything used to calibrate the usual academic/scholastic molecular clocks is wrong or, more precisely, extremely obsolote, last century ideas. As for the pedigree rate, that has been demonstrated false once and again each time a haplogroup that was not supposed to be there appears in ancient DNA. I still remember when Dienekes dropped it when E1b-V13 was found in Neolithic Catalonia, smashing his romantic dreams of being spread somehow by the classical heroes of Mycenaean Greece. Reality bites. And when you believe in molecular-clock-o-logy it bites doubly hard. Recently in some other thread it came by some ancient R1a1. Problem? If you considered Underhill's conservative chronologies it should not exist. The only way it could fit in is with his most daring chronological alternative, which was the only one calibrated to an actual ancient specimen, Anzick. It would alos fit in with my rule-of-thumb recalibration which gave even older dates. Problem is that molecular-clock-o-logy is in most cases purely scholastic: I apply this method because most say so and most say so because some other most said so before them and so on and so on until some guy who came up with the method in the 20th century based on archaeological and paleontholical data that has been later proven utterly wrong. That's the problem with scholasticism, one of the worst enemies of science, an enemy from inside. Anyhow, rigor has been lacking in all this matter: when C14 was proposed many decades ago, it had to pass the most strict tests before it was accepted as reliable method of dating. Nothing of the like is required for molecular clock methods apparently: it seems enough to have a list of references from previous papers, and nobody seems to dig on why those references have accumulated such obvious errors. In the end molecular clock is rather like economics (an extremely soft science, almost pseudoscience, in which wrong forecasting is condoned rather than sanctioned) and not at all like archaeology, in which hard evidence is required, let alone physics, where wrong forecasting is considered EVIDENCE of failure in the theory. I stand by my method because I do think that the basics of molecular clock are correct, although not necessarily precise even after correction, but that the calibration points are totally wrong, absolutely obsolote. "Using the 8 R1a lineages, with an average length of 48 SNPs accumulated since the common ancestor, we estimate the splintering of R1a-M417 to have occurred rather recently, B5800 years ago (95% CI: 4800–6800). The slowest mutation rate estimate would inflate these time estimates by one third, and the fastest would deflate them by 17%." The slowest one is the one using Anzick for calibration, and not scholastic references, which pushes the R1a-M417 node to c. 7.700 years ago (CI: 6.4-9.0 Ka). While this one seemed correct enough to me, I ventured, based on the hypothesis of the R1 node being c. 48 Ka old, that R1a-M417 would be c. 11.2 Ka old. So we can not consider these Tafoughalts samples as the ancestors of modern E-M78 subclades carriers (V22, V12, V65) ? What we see by contrasting the map of inferred patterns or E1b-M81 expansion and this ancient Y-DNA data from Taforalt is that the main E-M78 expansion was already done, that it should represent an expansion from older times, much as I2 seems to have expanded in Europe. This would allow for V61 ("from west Egypt to Morocco" per one decription of its geography) to have expanded from NW Africa, not necessarily from Taforalt though but somewhow related to it. thank's for your analyse Maju. I am posting a new article to you. This article is about the oghuz migration into anatolia and genetic change causied by migration. I hope you will enjoy and maybe you will interest for related topics. That's a blog article, right? I was not aware of that blog, I'll take a look, looks interesting (even all the other articles are in Turkish some seem worth asking Google to translate). Good job: nice looking. Or do you want me to reblog as collaboration? If so, please provide some introductory background on your blogging activity (a paragraph will suffice). I am very pleased that you liked the article,and no I am not a blog user,just a amateur curious person. I'm sharing you the posts that are of interest to me,because you are interested in many different things and your writings attracts others. Alright, thank you. I added the Turkish blog to my blogroll to the right. There is the paper.I did not send it first reply to make sure it was the right text. I finally found the paper I was telling you about,that baraban people cultural and genetic evolution paper which I lost. İt is not as detailed as I remember,but basic datas in the paper. Also,this study certified that pre androvo baraban people had same ethnic background. Did you happen to notice the hightened Eurasian affinity among some of these tropical African pops in the K=2 ADMIX results? It shows surprisingly high amounts of Eurasian in modern SSA pops like the Yoruba and Mende with the Dinka appearing even higher at around ~20%. It's billed as the first ADMIX calc to use ancient Central-Asian samples from this year's slew of recent papers. The ENF ancestry is around the same I got for "Farmer" in FTDNA's ancient origins calc, so I'm tempted to give this calc some cred. I know ADMIX calcs can be fickley but I'd like to get your interpretation on at least the paper's lower K results for these Tropical African pops. If there's any validity to the oddly high amount of Eurasian affinity, I'm guessing it must be a lot more ancient than the neolithic -- considering the phenotype of S.Sudanese pops like the Dinka, it's hard for me to fathom any substantial >10% post-neolithic Eurasian admixture. Sorry, Benjamin. Right now I don't have a clear opinion. It's clear that there is an Asian (or "Eurasian") inflow into East and North Africa, and that at least in this last case it has been there since the Upper Paleolithic. As for East Africa, Mota lacks the Asian element, while Tanzanian Neolithic has it, suggesting it's rather a Neolithic sort of inflow (but more ancient data is needed, because the region is large and complex). Anyhow low K values are confusing. Basically we're all quite used to divide the world in "black and white" (K=2) but Africa is way too complex to be considered as a single population, so that kind of East African affinity to Asia and Europe may be a mind trap and only mean that Asians (Eurasians) are closer to the East African aboriginal cluster than to other Africans (what makes all sense in terms genetic) and not that the orange (Asian-like) component implies genetic inflow. I would take as guide the K=6 or, better even, K=7 value, because it is there where we see a distinct East African component we can take as much more realistically representative of the aboriginal population(s) of the region. There we see the orange (European) element very reduced and the Asian influence still exists in form of North African (brown) and West Asian (green). That would be it, IMO. But take me with a grain of salt because I'm intellectually quite thick these days. "As for East Africa, Mota lacks the Asian element, while Tanzanian Neolithic has it, suggesting it's rather a Neolithic sort of inflow (but more ancient data is needed, because the region is large and complex)." That IS very complex indeed; I honestly overlooked that conundrum -- with more resolution throughout antiquity, we'll hopefully get a clearer picture. "I would take as guide the K=6 or, better even, K=7 value, because it is there where we see a distinct East African component we can take as much more realistically representative of the aboriginal population(s) of the region. There we see the orange (European) element very reduced and the Asian influence still exists in form of North African (brown) and West Asian (green). That would be it, IMO." Sounds like a fair assumption, thanks for the rundown Maju. Hopefully they'll be a dedicated paper on the subject in the near future. "..It even has a very small Eurasian/Out of Africa element that tends to show in these populations at the very lowest Ks (K=2 etc.). It can only be assumed that if these more divergent influences (excluding the small Eurasian element) were not likely present in it (we'll need ancient genomes from East Africa to truly understand the component); the component's affinity for Eurasians would become even more potent. It could perhaps even seem Eurasian itself as a result... It could possibly be assumed that there is a very ancient East African cluster within it, noted by lineages such as L3 while the rest is more divergent African input marked by other markers such as L0 & L2. Nevertheless, its current affinity for Eurasians brought about by the richness for example of lineages such as L3 in its carriers is quite evident. It shows in terms of whole-genome-wide variance as well as Fst distances." That's a wrongly-thought "Afrocentric" interpretation I have seen before (Ethyopis was also adamant of that idea). The reality is that Admixture won't give you such an old bilateral split, because autosomal DNA is so much affected by drift and remix that it can't be easily read into such time depths. I wonder if Dystruct could do that but definitely not with Admixture. Another reason is that Admixture (and in general any sort of statistical analysis algorithm) is very susceptible to sample bias, this also involves drift extremes; for example Finns always get their separate group and tend to falsely influence other larger populations, or Ashkenazi also do that a lot, but it's nothing but statistical noise; in a global comparison the highly drifted ones are East Asians, who have relatively low genetic diversity compared to West Asians, who are also slightly admixed with African blood, increasing diversity and reducing "Asianness". But sample size also matters: if you undersample Africans, they cluster as "Europeans", if you undersample West Eurasians, they cluster as partly "African", parly "East Asian"... whatever the case K=2 has in such "analyses" extremely bad statistical significance and that's about it. K=2 has good statistical significance when you compare two clear-cut distinct populations, say Nigerians and English, Chinese and Spaniards, etc. With three distinct populations you'd need K=3 and so on. With "n" populations, Admixture will tell you wich is the optimal analysis level or levels in the cross-validation data, which is typically horrible for K=2. You should not deviate much from optimal cross-validation K values, because that's getting into statistical noise zones. I agree that the "L3 family" (or should I say L2+L3+L4+L5+L6+L0(xL0d)?, because they tend to share Y-DNA lineages) is one of the big basal divisions of Humankind, probably the most important one in terms of influence to the present, not just out of Africa but also in Africa itself. But it can also be considered the very matrix of Humankind as well, with L0d and L1 "clans" being just early offshoots. Video: Do genes make you fat?